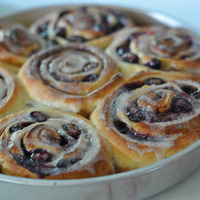 This is reminiscent of a warm, gooey, sweet blueberry cinnamon roll. Good to go as is, but give it a few days to a week to steep and it turns into something incredible. As others have said I absolutely love the blueberry note in this, which is not an easy task as it changes dramatically in respect to each recipes competing flavors. That being said the pastry was a little flat and dry for me. I've been on the hunt to figure out that 'gooey' aspect. Anyways well done! Beautiful blueberry flavor! I wouldn't have guessed blueberry and CDS could get along quite this well but they really do. Perfect pairing with morning coffee just like a fresh blueberry cinnamon roll would be, but with far fewer calories. Thank you for this!